Love a deal? This new and separate e-newsletter is for you! We often have items with very limited quantities remaining. Or maybe they are overstocks of a particular color. We need to move these goods out and will be discounting them greatly in order to get them to their new "forever homes"! This special newsletter will be sent out more frequently than our regular newsletter. Not daily, but probably once or twice a week. The quantities will be limited to what's on-hand so get what you want quickly---they will go fast and that deal will be gone for good. PLEASE don't send us hate mail if you sign up for this newsletter and find something you wanted sold out quickly. 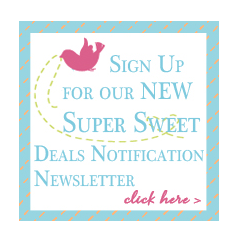 We aren't advertising these to our regular newsletter subscribers--only to those of you that purposely sign up to received notification of these "one and done" Super Sweet Deals! Thank you for understanding! Thanks and LET THE SPECIALS BEGIN!